Armand has been directing in big time shows started out working in cult horror films such as his first feature, starring a struggling actor the time Tom Hanks, in 'He Knows You're Alone' released by MGM as well as the classic 'Cameron's Closet', 'The Supernaturals' and then directed many episodes of horror TV shows such as 'Tales from the Darkside' and then got work up in Canada in 'Friday the13th: The Series' and 'Dark Shadows' which had a large cult following to prime time viewers. In 'Dark Shadows' he had many fond memories and stuck with 'Friday the 13th' for a whole year. Although it had no resemblance to the films with the hockey wielding maniac it was by the same company. Then he went back to the US to direct more episodic TV shows like Wes Craven's short-lived 'Nightmare Cafe' and Stephen King's 'The Dead Zone'. He carried on directing TV and film but bigger budgeted one's that were non horror like 'Touched by an Angel' and 'Reasonable Doubts'. Yet he still liked the genre and recently directed 'Dark Desire'. Let's see what he has to say on his work in the horror genre. who might have missed it about the plot. have been an accident and that Shane may be responsible. Caren goes to her son's college and begins to uncover more evidence implicating her young lover. She confronts Shane, who vehemently denies it. Panic sets in, and he begins to spiral out of control. Desperate to keep Caren in his grip and not have her find out the truth, Shane starts killing anyone who might stand in his way. Terrified that she could be the next target, Caren goes to the police. But the police won’t listen. Then, her husband is run off the road and Caren realizes that it’s up to her to protect what’s left of her family and not give in to Shane's dark desire. 2. In a way this as a return to the basics for you, as you started with horror and went back to it after a lengthy break. 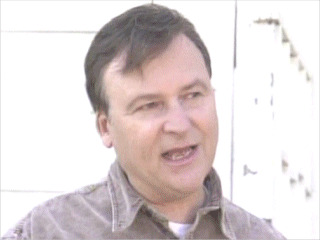 I've always enjoyed making a good thriller or horror film. Shooting a good script is essential no mater what genre it is. Thankfully, I've been able to make a variety of different films and keep my body of work diversified. My job is to make a good movie and that starts with a good script. 3. You were lucky enough to make a hit with your first feature, 'He Knows You're Alone'? That was a very important film for me as it opened doors to other films and relationships with producers. When MGM acquired the film He Know You're Alone became a film industry people paid attention to. I received a call from director William Friedkin who wanted me to make a film for his company and that's how THE KILLING HOUR got made. The success of the first film allowed me to make my next and so forth. It's not and easy road as so many films are made, especially today with the equipment that's easily available to filmmakers and distributers have much to pick from. It is for that reason filmmakers should try to make their films have a personal signature, a style that stands out from the rest. 4. This was also the first film on the big screen for Tom Hanks. How did that happen? Tom came in to read for me. This was my first film and I wasn't really familiar with the casting process. He arrived early, I was on my lunch break and we started talking. He impressed me with his winning personality and I knew he had to be part of this film. His character would bring a humor the film needed and I believed he was the right one to one to do it. I asked for his resume and when he produced it I saw he hadn't really done much other than school plays. The producers were reluctant at first...they wanted a more seasoned actor. I insisted and finally they allowed it. When the casting people saw him in my film he was offered a TV series 'Bosom Buddies'. The rest is history. 5. Have you remained in touch? Yes...We've met occasionally and he's sent me cards from time to time. 6. Besides direction, you have also gotten into introduction. Do you have a preference? I love making films and that will always be first and foremost for me. I've been producing films, developing scripts,appearing as a speaker in other films and writing introductions to books but directing is my first love. 7. 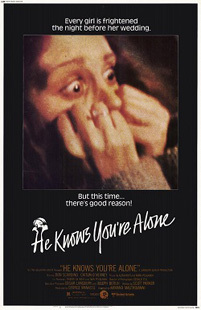 You had several other horror films out after 'He Knows You're Alone', such as 'The Supernaturals' and 'Cameron's Closet'. These are on DVD now, right? Most of the film I've made are on DVD including the mini series and television films. Some of the early ones such as The Supernaturals are available on VHS. I'm always getting messages from fans to have Supernaturals released on DVD but as of now I haven't been able to locate who own the rights to the film. I 'd like to see a new release distributed and would be willing to do a commentary. 8. You also worked on several television movies for Turner? Yes I made several films for TBS and Sony including a trilogy 'First Daughter', 'First Target' and 'First Shot' which were very successful for them and received highest ratings for that network. It was a great pleasure to work with them. 9. 'The First Target' series wasnt a horror, but certainly dealt with psychos. The saga of a President and his family constantly targeted by nut jobs, This series was pretty well received? This was an extremely successful series of films and was very well received by the viewers. The stories were filled with action and suspense written by the very talented Chad and Cary Hayes who went on to write some big budgeted horror films. They were great to work with and very connected to horror films so it made the writing process all that more fun. 10. You also worked as a director for varied episodes of 'Friday The 13th' and the new 'Dark Shadows' on TV? I worked on 'Dark Shadows' first as a director then a producer. Dan Curtis wanted me to remain on the series and supervise it. This was a wonderful experience as the cast and crew became a family and we enjoyed a lot of off time together. 'Friday the 13th' was shot in Toronto. I spent a great deal of time up there through some very cold winters and humid summers directing Friday and the other series Paramount was doing War of the Worlds. The stories were different enough to keep me interested as I was able to give each show a different look. It was my work on Friday that attracted Dan Curtis who asked me to direct Dark Shadows. One thing always leads to another. I've formed a production company Shore Road Entertainment, Dark Desire was it's first film. I'm currently in development on two other scripts which I will make through Shore Road and I'm working on a series for cable TV. I intend to keep busy doing the thing i love to do. 12. In your opinion what differentiates a good director from a bad director? I believe a good director is one who's able to take the printed word, conceptualizes it with actors and the technical people who help him visualize it on screen and relate it to an audience in a clear efficient way. There are many types of directors and they all have a different way of working but it is the end result that is most important. Does the story work? Is it presented in a clear and relatable way and is the audience affected? A good director will make that happen. 13. Of your films what would be your favourite? I have issues with every film I make. I always reflect on the finished film and think I could have done this better or I shouldn't have done that so I'm very hard on myself. It's hard for me to say which one is my favorite. The Ring, a mini series based on a book by Danielle Stelle is one that everyone seems to love and one I feel proud of. There are things I would have fixed in that film too, had I more time. I guess I'm the wrong person to ask. 14. Any interesting behind the scenes stories form your most recent movie? Being in control of Dark Desire was both a blessing and a curse as I was making decisions dealing with money and directing the film at the same time. It was a bit daunting but I'm happy that it all worked out and the film was highly received. I'm looking forward to making more the same way and hopefully learned form my mistakes. One of the events that occurred on Dark Desire involved an elaborate stunt which we wanted to shoot at dusk. We made a great effort to achieve that but as the sun set we knew we wouldn't make it so we went to plan B which involved a costly lighting setup and un budgeted funds to pay for the extra time and equipment. We had to finish shooting the scene and couldn't come back. So everyone went into high gear and helped come up with innovative ideas to help expedite the shooting. Compromises were made but ultimately the end result was achieved. Making films has always been my passion and journey in life. I've tried make films that not only entertain but enlighten. Anyone who puts their work out there for evaluation hopes their message is communicated properly and appreciated by all. I dentify with filmmakers today just beginning that journey and wish them the best.